Substance abuse rehabilitation is the beginning of a new chapter of your life. In addiction treatment, you are uncovering the root cause of your substance use disorder, and learning a new way to live— equipped with skills and tools to help you rebuild. Rehab for alcohol or drug addictions will involve intensive therapies, which will begin the work of recovery. Your recovery process is unique to you, and at Royal Life Centers, we acknowledge that by providing individualized treatment. The recovery process holds so many changes, all will positively effect your life. Royal Life Centers makes this easy, as we have structured programs that create routine in your day. Our programs are made up of a variety of intensive therapies, including: individual therapy sessions, group therapy, behavioral therapies, adventure therapy, activity therapy, and equine therapy. Guests will have a schedule of therapy built around meal-times, and some free time. No matter what, you should be putting your recovery and sobriety first. Ways you can do this is by making sure you attend meetings, which are 12-step program of recovery support groups. At Royal Life Centers, we introduce guests to 12-step programs of recovery and provide meetings in our facilities. We also provide transportation to and from 12-step meetings in the local area. Prioritizing your recovery can look like many things, for example it could mean cutting off communication with toxic people, speaking with your primary therapist about any concerns, meeting with your case manager to set your sobriety up for success, and not engaging with those who are not serious about their recovery. A sponsor is basically your mentor through recovery. You can find a sponsor at any 12-step meeting or support group for addiction. A sponsor is someone that takes you through the 12 steps, and someone that you can call to get guidance and support from. Because a sponsor is someone who is also in recovery, they are an invaluable resource for someone just starting their journey through the recovery process. We recommend finding a sponsor who has experience and time in sobriety, so that they can best guide you. A sober support network is a network of people who are sober, that you can call and go out with to strengthen your recovery. You can add people to your sober support network by going to 12-step meetings and introducing yourself, asking for a numbers list, or sharing to ask for support. People in 12-step programs of recovery are eager to help the “newcomer” or the new alcoholics and addicts in the room. So reach out for help and guidance and you are guaranteed to gain multiple sources of support to build your network. The people in your sober support networks are the people you can call if you need advice, are having a good or bad day, need to know how to get through the stages of recovery, or just need someone to talk to. These are the people you should get to know, as they will teach you what it’s like to live in sobriety. Setting yourself up with a sober support network will give you a solid foundation for when you complete addiction treatment. Being in substance abuse rehabilitation at Royal Life Centers provides each guest with many resources. Guests have a primary therapist, case manager, psychiatrists and other medical professionals, staff members, and peers at their disposal. This internal network of support is extremely important to use in your journey of recovery, as through out your journey you will be addressing thoughts, behaviors, and the impact of your alcohol or substance use disorder. Royal Life Centers provides each guest with these resources so that guests can fully benefit from each of our services. At Royal Life Centers, everything you say and everything that others say during therapy is confidential. Our facilities are a safe space, so if you feel unsafe for any reason, please speak to a staff member to remedy this issue. If you hear about anything unsafe, reach out to staff in order to keep your environment safe. Confidentiality is also very important to us, which is why we maintain the position that anything and everything said in our facilities are confidential and not to be spoken about outside of the therapeutic setting. Everyone inside of our facilities are entitled to remain anonymous, which is why we comply with HIPPA laws and take confidentiality very seriously. In our inpatient programs, we have an in-house private chef that prepares guests three balanced meals each day. This makes it easy for inpatient guests to get the nutrition they need in early recovery. Once guests have transitioned to our after care programs, they should have a good idea of how to properly provide themselves with balanced meals and nutrition. Nutrition will play a large role in recovering from alcohol and other substances, which is why our nutritional program in our inpatient services set guests up for success. Triggers are people, places, or things that trigger a craving for drugs or alcohol. In the recovery process, it is extremely important to identify what triggers you while you are in the safe environment of our treatment center. Triggers are best identified in inpatient treatment, or residential treatment, so that the guest can manage their cravings in the safety of our protected environment. Goal-setting is very important in the recovery process. Setting goals will give guests something to work towards. Whether the goals you set are big or small, having a goal in mind will help guide your behaviors and actions to achieve that goal. We encourage guests to set goals to enrich their recovery process. Even one week sober is cause for celebration! It is extremely significant to celebrate your achievements in the recovery process, as they are motivation for you to keep doing the right thing. Rewarding yourself for your healthy achievements and meeting your goals will encourage you to keep going. Milestones to celebrate in sobriety can also be achieved by picking up a coin or key tag in a 12-step meeting, which have these markers to denote your time in sobriety. In recovery, it’s easy to focus on all that you have lost from your addiction as you realize the impact your alcohol or substance use disorder has had. 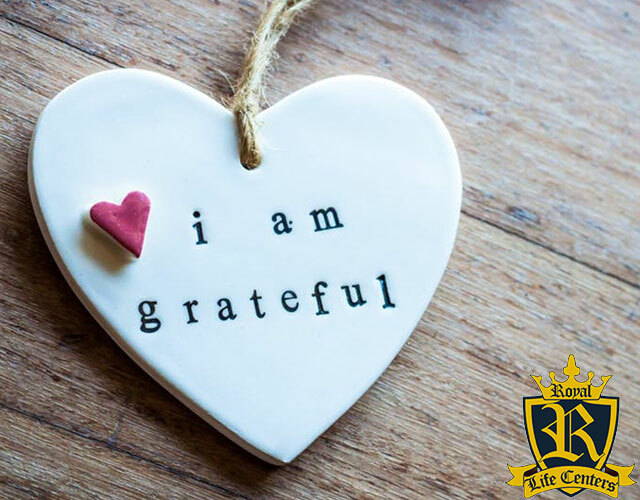 We encourage guests to focus on all that they have, and to be grateful for the chance to change their lives with addiction treatment. Getting substance abuse treatment is already something to be grateful for, as less than 10% of those who need addiction treatment actually get it. If anything, you can be grateful to have survived your addiction and in having the chance to rebuild a happy, healthy, and meaningful life in sobriety. If you are seeking addiction treatment, Royal Life Centers is your best option. Our treatment facilities provide rehab programs that only use proven effective treatments. Our rehab centers are located in Washington state and Arizona. Royal Life Centers has a variety of treatment programs, including: medical detox, a residential inpatient program, a partial hospitalization program (PHP), an intensive outpatient program (IOP), an outpatient program (OP), sober living and graduate housing. Guests will collaborate with their primary therapist and case manager to build a treatment plan tailored specifically to meet his or her needs and goals. The recovery process often starts with our medical detox program to address any withdrawal symptoms. For an addiction center near you, please review our list of locations. If you, or someone you love, is struggling with an addiction, please reach out to us at (877)-RECOVERY or (877)-732-6837. Our addiction specialists are available to take your call 24 hours a day, 7 days a week. Because We Care.